In March, Syracuse University’s Martin J. Whitman School of Management held a reception to celebrate its recent partnership with the National Black MBA Association (NBMBAA) as part of the Collegiate Partnership Program. The Whitman School is looking forward to the future of this partnership, and is excited to continue holding events to further diversity efforts in tandem with the NBMBAA Collegiate Partnership Program. 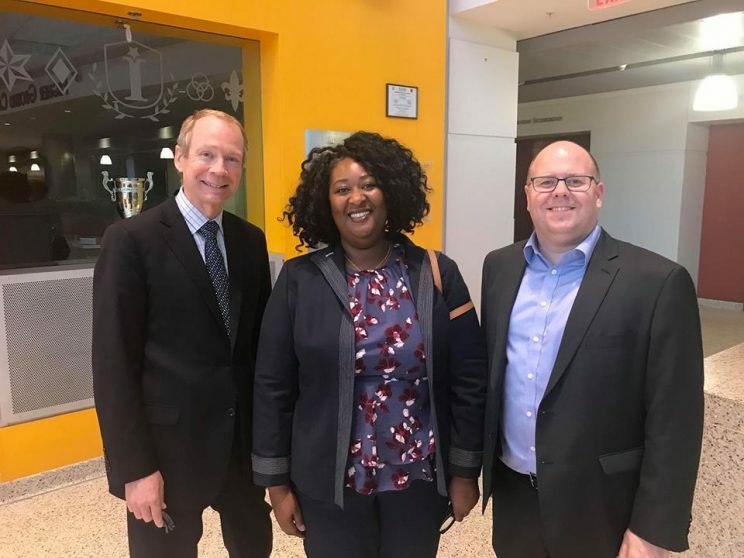 Tamu Brown-Hutchinson, president of the National Black MBA Association, Western New York Chapter (center), Dean Gene Anderson (left) and Alex McKelvie (right), associate dean for undergraduate and master’s education, at the reception to celebrate the recent partnership.